High Water Bugs | How big is too big? The major flex of run off has shown its strength and is now beginning to relinquish the high water patterns our rivers have been experiencing. As the volume in our rivers begins to diminish float fishing becomes a special way to fish. The water is at an enjoyable level to float and the fish are ready to put on the feedbag. Increasing the size of your fly is a good option for the changing water conditions. But how big is too big? What is happening in the river? The rivers although past the highest crest for the year are still high. Wading conditions will be prime soon but for now float fishing is ideal. The water temperature is increasing, and the clarity of the rivers is improving rapidly. However there is still a good amount of turbidity in the water. Take advantage of that color now by increasing the size of your nymph or dry fly. Increasing your size of fly and the resulting larger silhouette work to attract hungry, run-off battered trout into eating. Caddis nymphs are actively emerging and performing their bouncing surface dance. Casting bushy, size 10, Elk hair caddis dry flies into pockets along the banks will catch the attention of hungry trout. Attaching a trailing emerger pattern to your dry fly like the X-caddis or even an old-school nymph pattern like the Prince Nymph allows anglers to cover two different levels of the upper water column. The guides at Vail Valley Anglers can place you in the best position for this exciting approach. Stoneflies are still tumbling along the bottom of the river, being knocked loose by current and debris. The nymph stage of some stoneflies can be up to three years so there are always stonefly nymphs around and in different sizes. Large Stonefly nymphs, size 4, can bring crushing strikes sub surface from aggressive brown trout and hungry rainbows. Big bushy dry flies are a good choice for keeping track of your fly in the still choppy conditions as well. A large stonefly dry supports the heavy, competition-style nymphs tied on barbless jig hooks with tungsten beads that are used regularly by anglers. 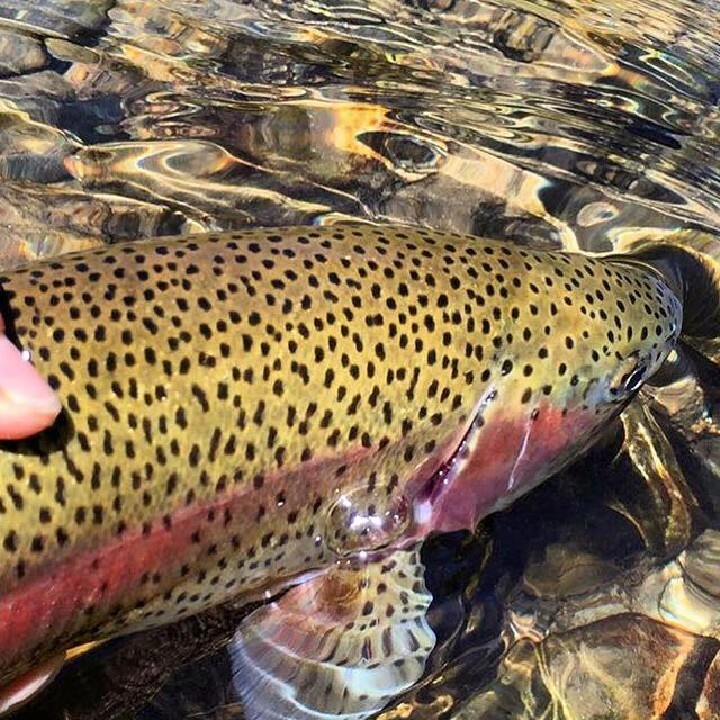 Vail Valley Anglers carries a unique stock of these super effective nymph patterns. A few other flies of note for this time of year are Pale Morning Duns and Yellow Sallies. Both are emerging in high numbers, along the Eagle River especially. Nymph patterns of both flies fished early in the morning are effective and a variety of dries are producing results for when the hatch is really popping. Mid-morning sunlight catches the fluttering wings of the Yellow Sallies giving a sure sign to start casting a large yellow dry fly pattern. Puterbaugh’s Yellow Foam Bodied Caddis, nicknamed the Spongebob is my personal favorite. I like to up the size of this pattern for the rough water to a size 12 for visibility it rides on the surface a long time and easily supports a dropper nymph. This fly can imitate a variety of bugs when fished at this time of year like an adult caddis to a Yellow Sally dry. Don’t forget to consider a rogue fly pattern like a Cicada. The nationwide emergence isn’t just designated to a small area of the U.S. they’re everywhere. Just listen. Evenings are a great time to catch the piercing hum of the Cicadas. These large bugs are falling into the rivers and stillwaters everywhere. Tied on a size 4 hook it’s a pattern you can fish with reckless abandon given to dainty dry fly casts. This bug goes splat on the surface with a thud! And then it shimmies and shakes on the water until something has to eat it. A prime example of how widespread the Cicada hatch is I was casting Cicada patterns to bluegills and bass in the Florida Everglades a few days ago on June 22nd. I am casting the same dry fly Cicada pattern to trout in the Colorado Rockies today, June 26th. And I am planning a trip to the Flaming Gorge in Utah to fish Cicadas on July14th. A little about the fish. The scattered trout population has taken up residence along the bank in pockets, behind boulders and along soft edges. Deep eddies are still havens for trout to sit and rest and actively feed but the runoff has moved the majority of the fish dispersing the numbers along the river’s course. Floating the Eagle and Colorado Rivers casting upsized dry fly patterns into tasty little pockets results in aggressive takes. Take just enough time to play the fish quickly and efficiently this helps sustain our natural resource. Netting the fish and maintaining touch with the water is the best way to handle our Colorado trout. The fish are our number one concern right along with the water. 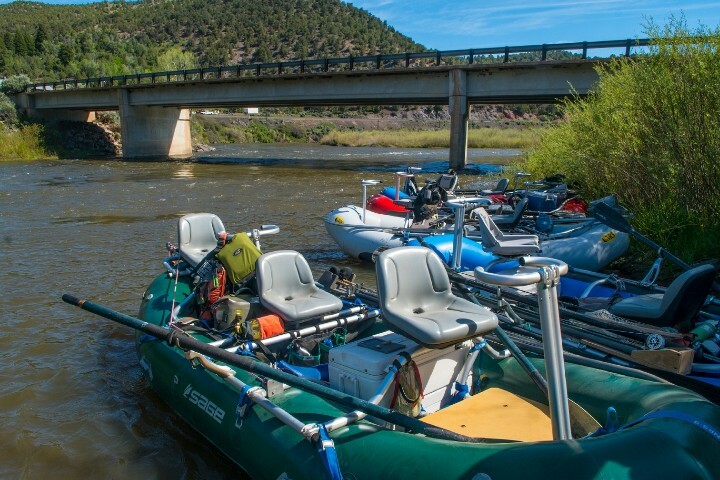 Helping out to bring your own water bottle along on the float or wade trip is another nod to Vail Valley Angler’s concerted efforts at providing a sustainable experience for years to come. 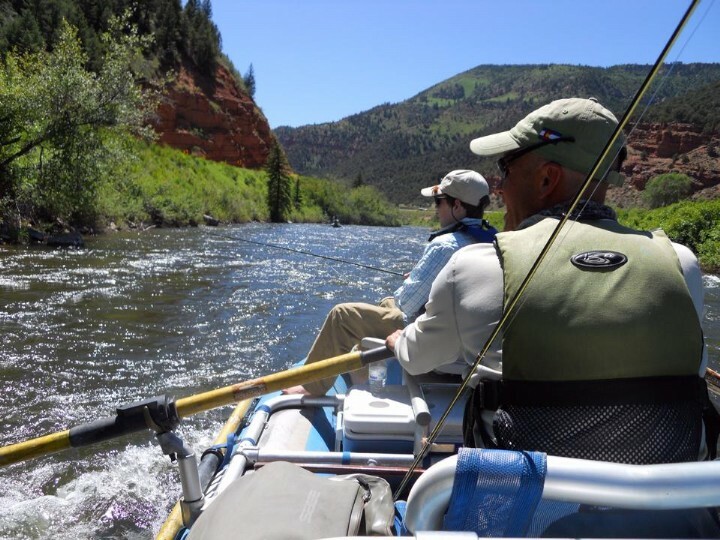 Fish First is our effort to maintain fly fishing in the Colorado Rockies and the Vail Valley. Please join Vail Valley Angler’s efforts for sustainability. So how big is too big? At this time of year you can’t go wrong upping the size of your flies for fish attracting power, for your visual tracking and for tempting the largest trout in the watershed into eating. Lots of bugs are there for your choosing as the hatches are just forming into their summertime predictability. Caddis, Stoneflies and natural phenomenons like Cicadas all provide larger than life choices for your fly fishing offerings. Vail Valley Anglers delivers the safest, most productive float fishing at this time of year. Book your fly fishing adventure today.